Surgent has recognized Bill Taylor, CPA, with the James L. McCoy Discussion Leader of the Year Award for the 2015-2016 teaching season. The McCoy Award is the highest form of speaker recognition conferred by Surgent. It was established in 2009 in honor of esteemed Surgent discussion leader James L. McCoy, who passed away in 2016. To be eligible in a given year, a discussion leader must teach at least 20 seminar dates. Of the discussion leaders who meet this criterion, only the individual with the top average scores for speaker knowledge and presentation skills is recognized. Surgent staff speakers and speakers recognized in the immediate prior year are not eligible for the McCoy Award. In addition to his teaching work with Surgent, Mr. Taylor is the President of Benefit Solutions, Ltd., a benefit consulting firm, and runs a small tax practice. He is also an Adjunct Assistant Professor in the Masters of Business Administration program at the University of Mississippi. Amy Plent, VP of Content at Surgent, presented the award, and also recognized the twenty-seven additional Surgent discussion leaders who qualified for Outstanding Discussion Leader status for the 2015-2016 season. This status is conferred for teaching at least 15 seminar dates and maintaining average scores of at least 4.5 out of 5.0 in both the speaker knowledge and presentation skills categories. 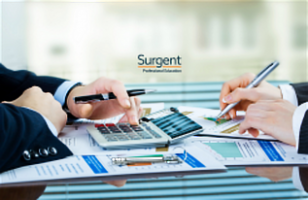 Learn more about Surgent and its top-quality CPE faculty. Self Study vs. Webinars: What’s the difference?